Finca Montesquerio is a modern resort for social and corporative events where wood veneers have been used to define an atmosphere of sophistication and richness. 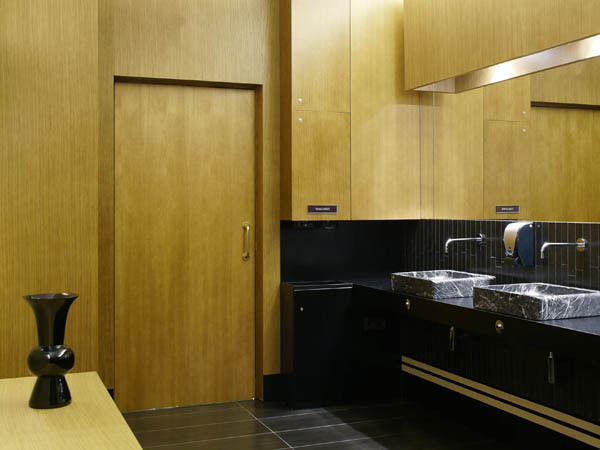 The facilities include different public rooms for meetings where Larch is protagonist. 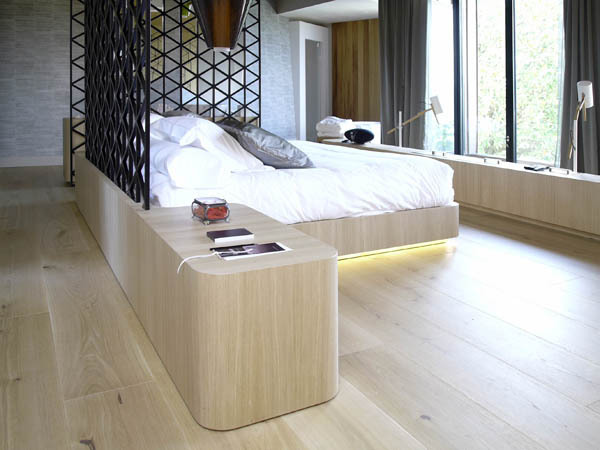 The project also includes the use of Oak veneer for more private rooms such as the suite. For CHANNEL VENEERS Oak veneer is not just a product, it is a category that offers a wide range of final wood surfaces. 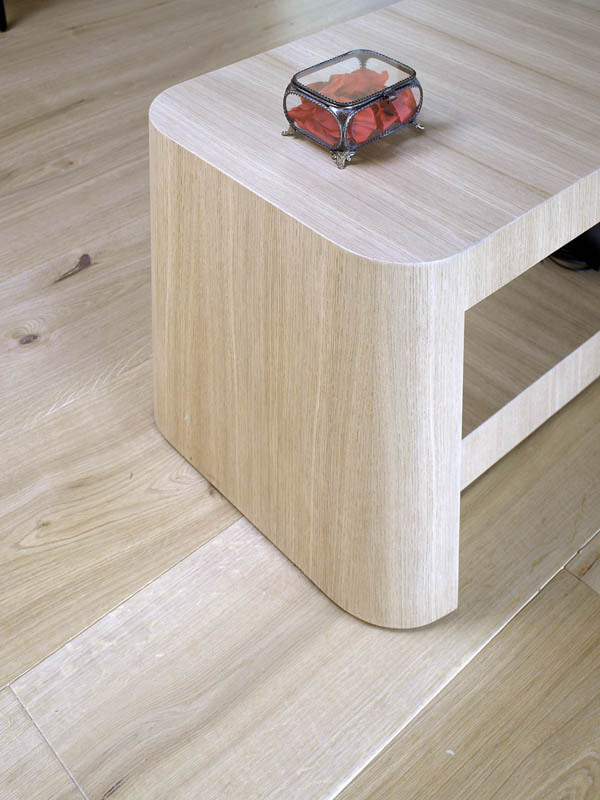 Oak is well known due to its natural durability, hardness and strength. It is a clear wood that shows different appeal depending on the way it was cut: Crown cut, Quarter cut or Rift cut. At Finca Montesqueiro Suite it is possible to recognize the different Oak surfaces as the cutting of the log, and the log itself, has been previously chosen to maximize the decorative effect of every surface. 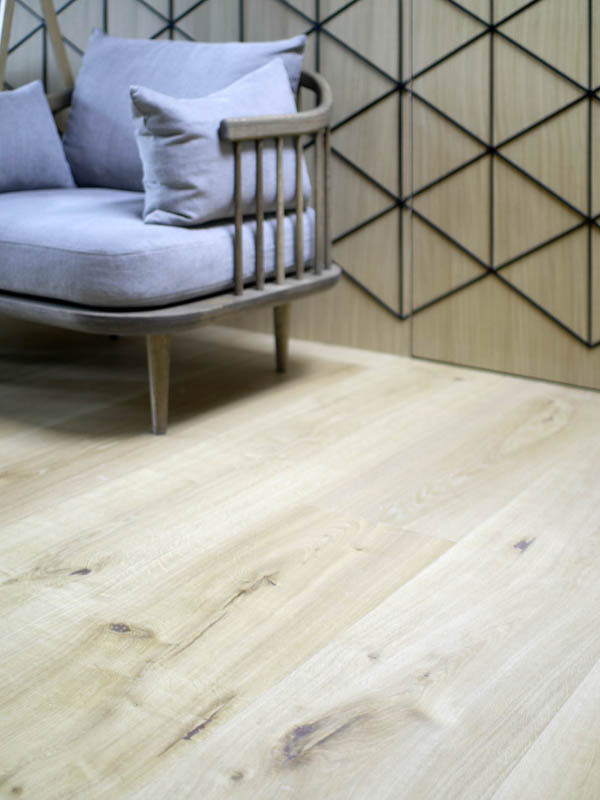 For the flooring, the designers at Finca Montesqueiro have chosen Crown cut rustic Oak. 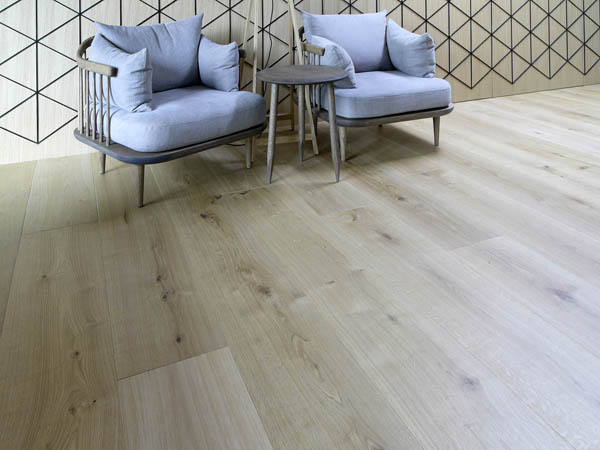 Wide logs with sound knots have been selected to obtain a surface of wide boards full of beautiful natural effects. Oak is a choice for flooring due to the hardness that is required for this use. 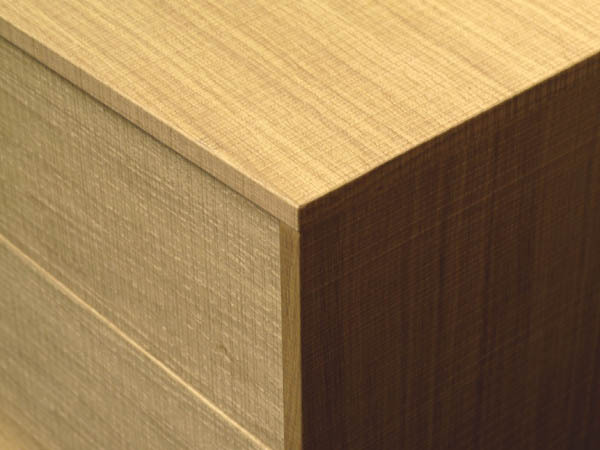 In order to improve the behaviour of the surface, thick veneer has been used. The thickness of the veneer (1,3mm) makes possible to absorb possible impacts and defects as if it was solid wood. In contrast with the rustic flooring, the panelling of the suite has been made with Quarter cut Oak. Although the wood specie is the same, the finishing differs. The Quarter cut defines a structured surface where the figure shown by the material is straight and regular. This decorative effect has been intensified by means of metallic incrustations. Those elements define a regular pattern that results in a more sophisticated atmosphere. 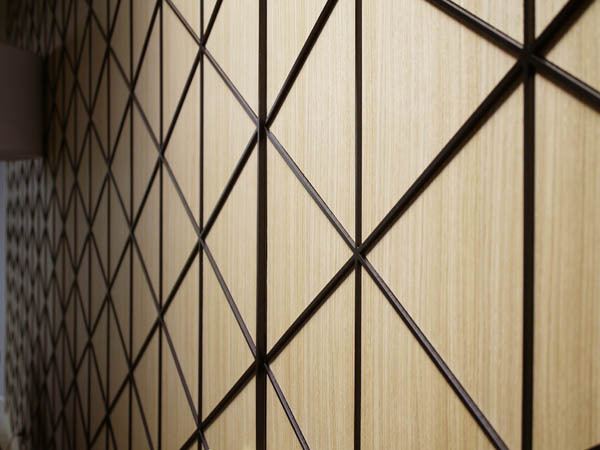 As no heavy impact is expected on vertical surfaces, thin veneer (0,6mm) has been used to cover the wall panelling as well as the furniture. 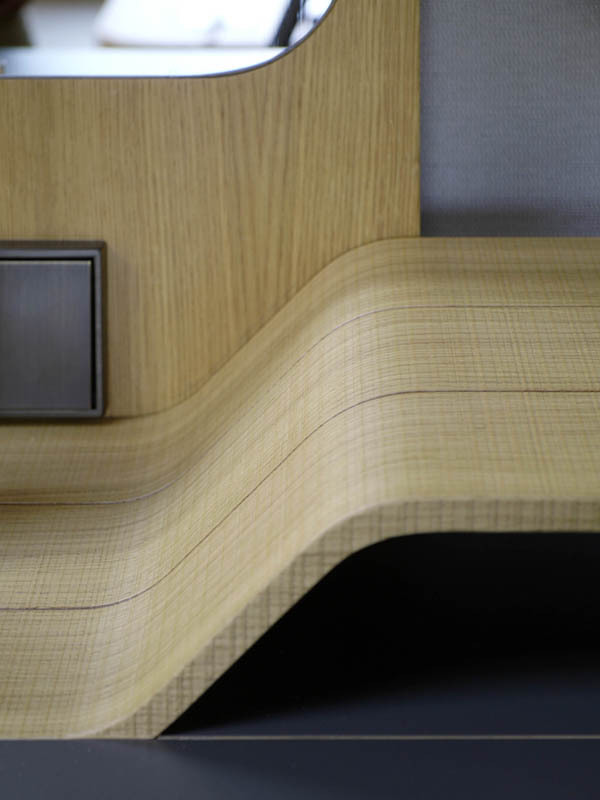 Thin veneer makes possible to reduce wood consumption and also allows decorative effects such as bending. At Finca Montesqueiro Suite we find veneer bending in both directions. In one end, the side tables have been veneered bending Quarter cut Oak veneer parallel to the grain to avoid corners. On the other hand, desk table top has been bended across the grain to achieve an original decorative solution. In addition to the different finishings of Oak veneer that are possible throughout the cutting, also surface texture defines innovative possibilities. Regarding the rough wood surfaces, at Finca Montesqueiro we discover the texturized Quarter cut Oak veneer. It is a wood surface that resembles sawn-cut solid oak. 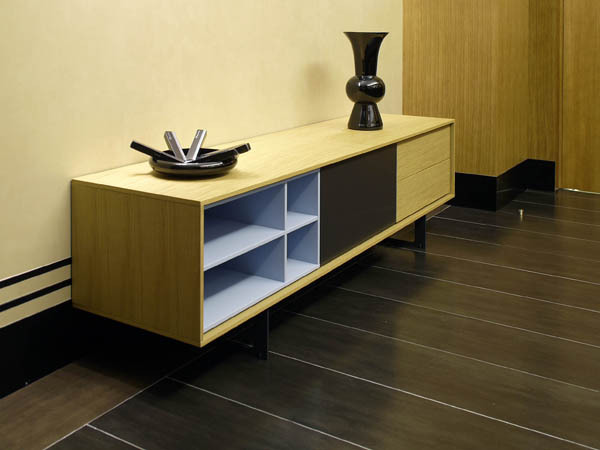 The natural appeal of this material is enhanced by using it in contrast with plain colour boards. The different Oak veneers offered by CHANNEL VENEERS provide a wide range of decorative effects making possible to achieve newness by using a classic and nobel material such as Oak.